A nice tyre suitable for either road or touring cycles. Now one of the few remaining decent quality tyres available in this hard to get size. Kevlar folding, aramid belt - exclusive to St John St Cycles. ConsNot compatible with vintage hookless rims. Glad to find a 1 1/8 tyre at so reasonable a price. Went on nicely, & looked handsome. However, on inflation it levered itself over the rim. Hadn't come across this before, but it turned out its sidewalls are designed for hooked rims, & the lighter sidewall construction wasn't happy in my vintage hookless rims. So not able to try it for ride. ConsSidewalls are a bit delicate. These are great tyres but I've cut the sidewall on two while riding on clinker typre tracks. Fine on roads, even bumpy neglected ones and never actually had a puncture in 100's of miles on them. I've got a 30 year old Claude Butler and similar age Raleigh Road Champion and they make these bikes both look the part and perform well too. Hope they continue in production for years to come. Bit hard to fir initially but the old soapy water trick does the job nicely. Excellent tyre that is worth every penny. Rolls well on the road and has performed very well on dirt and gravel tracks (some of them very rough). Have used them for light touring and have had only one puncture in around 2000 km of use (right at the begining when I hadn't checked the tyre pressure). The can be a bit tight when fitting them and they really do need to be pumped to 105 psi to avoid punctures. Looks the business on my 1960's frame. Rolls well, good fit, no punctures so far, thoroughly recommended for a commuting or light touring tyre. Wouldn't go on rough surfaces on it, but will cope well with reasonably smooth dirt tracks. If you have spent the time and effort building up a classic lightweight with 27" rims you need a matching performance tyre and this is one of the few left on the market. I tried a set on the L'Eroica classic on Italian hard packed tracks with no punctures. It is possible to get the wire beaded version a bit cheaper but this is the only UK souce of the lighter folding version. Can I use this with 271/4" rims or so they have to be 27 1/8"? I have 271/4" rims with the bead-the only question is are these too narrow? Also, as they are beaded, I imagine they are good for 90 psi? These will be fine on 27 1/4. The two sizes relate to 27" x 32mm (1/4") and 27" 28mm (1/8"). Yes these are beaded, it will need to be fitted to a hooked rim. These will not be suitable for hookless rims. Please tell me shipping charge to Japan . Please add the items you wish for to your basket and go to the checkout page. On the left you can select the destination, the postage will then be updated. 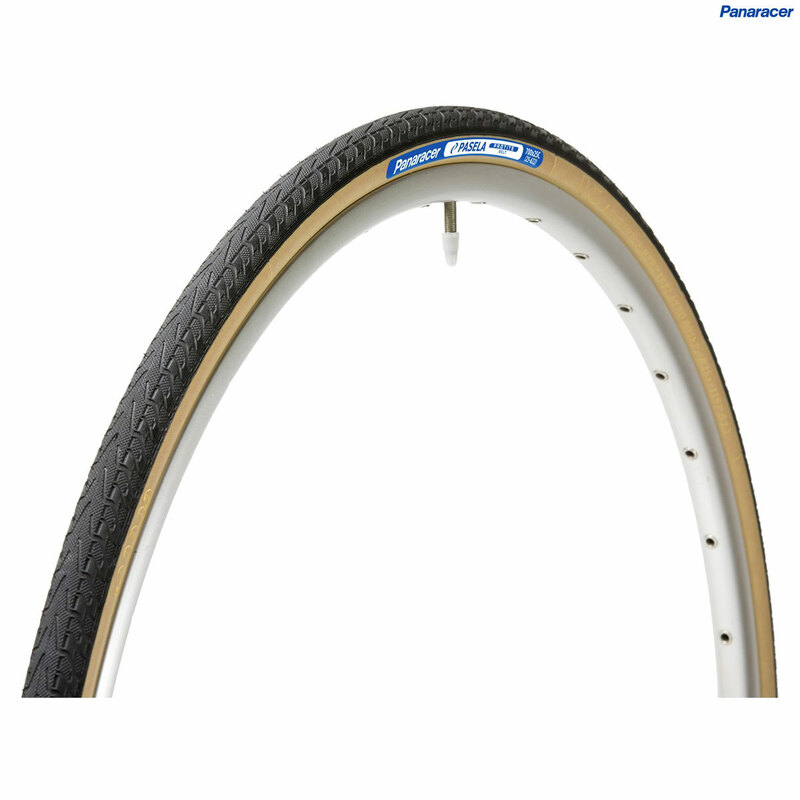 Hi, I was wondering if these tyres would be OK on older-style clincher rims which do not have quite such a pronounced 'hook' on the inside for the tyre bead to pull up against? The rims I'd like to put these on have more of a 'bulge' than a sharp hook. If not, do you do these tyres in a wire bead version (but still 1 1/8 wide?) Thanks. These tyres should be fine for use with your rims. Can You Confirm The Tread Pattern For The 27 Inch Tyre. Is the tread pattern for the 27 inch tyre actually as shown in the picture as the Panaracer site states that two tread patterns are available. This picture on our website is correct, all of stock match the tread pattern shown in this picture. Can You Confirm This Tyre Is Exactly As Per Listing? The basics of the tyres are identical to what is listed, they are definitely 28x630, can take 105psi and are the folding version. The only difference is they've changed the Aramid fibres in the chemical construction of the tyre, the performance of the tyre has not been altered because of this. Due to legislation issues, they have been re-branded as the Pasela PT which will be the only physical difference.